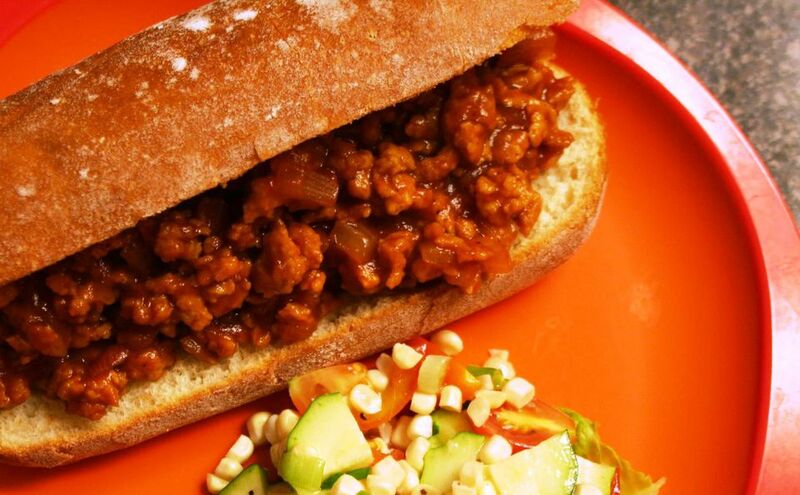 Looking for a vegan TVP (textured vegetable protein) sloppy joes recipe? These meatless sloppy joes made with TVP are perfect for your vegetarian or vegan kids or teens and are much healthier than regular sloppy joes. Sloppy joes are fun (and messy!) to eat. They are great for a crowd and kids (and adults) love them for lunch or dinner. This healthy (or at least healthier) vegetarian sloppy joes recipe is made from well-seasoned TVP instead of meat and is both vegetarian and vegan. Using TVP instead of meat makes these healthier sloppy joes cholesterol-free and much lower in fat than a beef or even a turkey sloppy joe recipe. TVP is a great food to both buy in bulk (check the bulk bins at your local natural grocery store) and incorporate into your food repertoire if you're cooking on a budget. It's a bargain when bought in bulk and much cheaper than meat. If you're looking for a kid-friendly and budget-friendly vegetarian dinner idea or vegetarian sandwich idea, these are a perfect solution. This meal also works well if you are hosting a crowd and need a vegan option. You can make meat sloppy joes and TVP sloppy joes. Both can be served with the same rolls and sides. Just the fillings will be different. Leftover sloppy joes filling can be used up the same way that you can use up leftover chili: make chili mac casserole, stuff it inside bell peppers with rice, or simply portion out your leftovers into individual size containers and stick it in the freezer. They will be all ready to grab on early mornings when you need to get out the door quickly and haven't yet packed a lunch! In a large skillet, saute the onion and bell peppers in olive oil for 3 to 5 minutes or until onions are soft. Reduce heat to medium-low and add the vegetable broth and tomato sauce, stirring to combine well. Once the broth and tomato sauce is combined and hot, add the chili powder, soy sauce, hot sauce or Tabasco sauce, sugar, and TVP, stirring well to combine. Allow to simmer for at least 15 more minutes and season well with salt and pepper. Taste, and adjust seasonings to taste. Your vegetarian sloppy joe mixture will thicken slightly as it cools, so don't worry if it seems a bit too thin while cooking. Spoon the TVP sloppy joe mixture onto hamburger buns and serve hot. If you prefer a less soggy sloppy joe, lightly toasting the hamburger buns first is a good idea. If your family enjoyed this meal and you're looking for more ideas for what to do with TVP, try these vegetarian and vegan recipes using TVP.